Find, befriend, and battle more than 350 new and returning YO-KAI™. Hop on a train to seek out new towns and new Yo-kai. 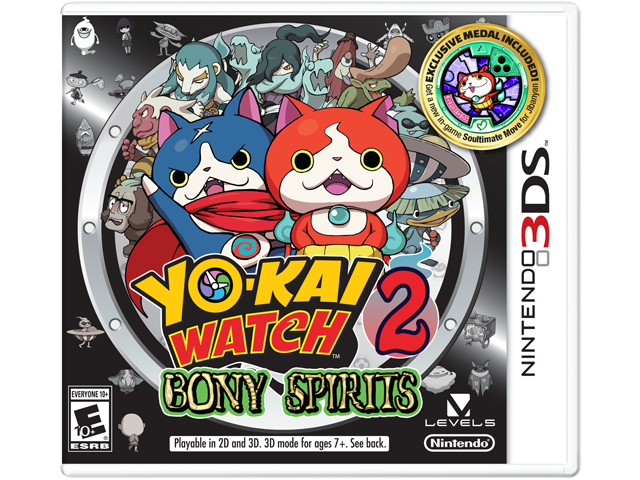 Teaming up with the heroic cat, Hovernyan, travel back in time to save Springdale, and witness the origin of the YO-KAI Watch! As the cause of all of life's troubles, YO-KAI are hiding everywhere! Explore the seaside town of San Fantastico or the sleepy village of Harrisville in search of new YO-KAI to befriend. Then time travel 60 years into the past with a new hero – Hovernyan – to ensure the YO-KAI Watch Model Zero is created and your timeline is preserved! For the first time, battle friends* online or via local wireless to earn rewards for the main adventure. To earn more, guide a YO-KAI through an all-new 4-player co-op action mode!